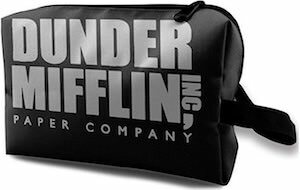 Now there is this Dunder Mifflin Toiletry Bag that is made for all the fans of The Office. This makeup bag is black with on the side a big logo of the Dunder Mifflin Paper Company that we all know from that hit TV series The Office. The bag is great for organizing your little travel needs like makeup and toiletries and even besides travel this Office bag can be useful for organizing all your travel needs or maybe things at home or even the office. At 10 x 5 x 6 inches there is plenty of room and the strong zipper on top is made to last you a long time. 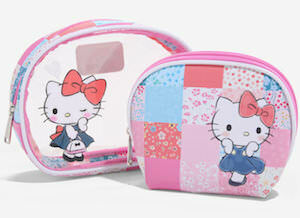 If you like Hello Kitty and need a place to store you makeup then you just should check out this Hello Kitty makeup bag set. The set includes two makeup bags one slightly bigger then the other so that you can store them inside each other when not in use. One of the makeup bag is see through and the other has a light colored textured squares on it and both of the bags have a cute girly looking Hello Kitty on it and she is wearing a cute blue dress. Now you don’t need makeup to get lost because you can put all your makeup in a fun Hello Kitty makeup bag like this.